Threepenny Day. February 27th. Eton near Windsor Berkshire, England 1975. In 1514 Mr Robert Rede of Burnham near Eton left in his Will a sum of money that gave each boy in College 2d to attend his obit service and annual requiem. He stipulated that his and his wife’s memory shall be “recalled yearly, while the world shall endure.” Provost Lupton left in his Will dated 1535 a further 1d for a like purpose and to help improve the boys food. In Lupton’s Will he also bequest a further 2s 8d, to succeeding Provosts, other members of staff received 1s 4d and less depending on status. The scholars still received the 1d in a threepenny piece, the other 2d being from the gift of Provost Bost who succeeded Lupton. Lupton was an English ecclesiastic, lawyer-cleric, chaplain to Henry VII and Henry VIII and Provost of Eton from 1502-1535. (The chairman of Eton’s governing body.) The annual Threepenny Day distribution takes place after lunch in the College Hall on the anniversary of his death. 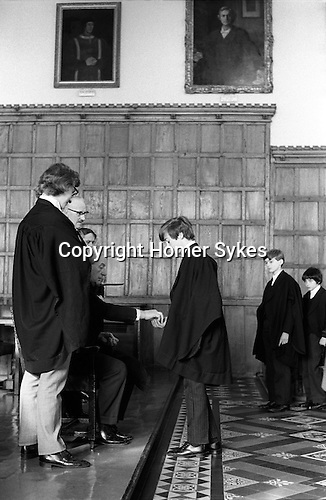 After lunch starting with the lowest boy, there are seventy Collegers, known as Kings Scholars, these are boys who have passed the College Election examination and have been awarded a scholarship line up to receive a threepenny piece. Kings Scholars are distinguished by their black gowns, and have the initials KS attached to their surname on all school lists. The other boys at the school, more than 1200 of them, are known as Oppidans. They dine in the College Hall alone, and play the winter term wall game for five years, whereas Oppidans play usually, only for one year. With the introduction of decimal coinage in 1972, and the abolition of the threepenny piece. Provost Caccia bought up large stocks of redundant coins to ensure continuation of this custom. The Captain of the School is entitled to any threepenny pieces left over owing to absentees. The Captain of School, Provost Harold Caccia, The College Butler with tray and Master-in-College, Rev. Canon P. Pilkington.